Last year was my first 5K race in this event. This year my goal was to beat last year's time of 41.26. In fact, I determined to finish in less than 40 minutes. I got off to a bad start when I was late and had to do a fast walk to the race site. The race was already under way when I arrived, but there was a large crowd waiting to cross the start line, so I just joined the back of the crowd and was one of the last to cross the start line. It didn't matter, though, since the chip on my shoe allowed recording of my actual start time for calculation of my total time. The route seemed the same as last year, heading east on Maple street starting at the courthouse building in the Mason town square. There were checkpoints at the one mile and two mile marks. I thought I was running a bit slow to make my goal, but then I realized the elapsed time shown was from the official start of the race. My actual start time was 1:20 after the start of the race, so I was actually moving faster than the elapsed time shown at the checkpoints. I alternated jogging with fast walking and achieved my goals by finishing with a time of 39:24, improving on last year's time by just over two minutes. I decided to leave the camera at home and concentrate on getting my best possible time. The following photos were taken when I picked up my race packet with my event shirt, identification bib number and timing chip to attach to my shoe. Shown are the tents where the packets were distributed plus some of the water set out for the runners/walkers. Also shown is the assignment list showing my bib number (73). My wife pinned the identifying bib number to the back of my shirt before the race. Using these numbers the P.A. announced told the viewers the name of each racer as they approached the finish line. 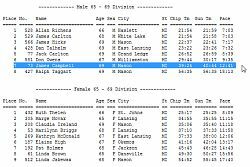 I took a screen shot of the official finish results posted on the web and show it below with my results highlighted.